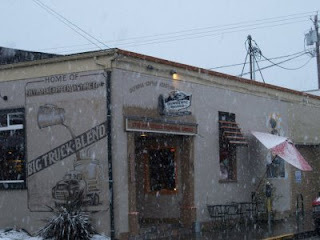 Pure Coffee Blog: CC: Olympia Coffee Roasting Co.
Winter storms certainly have charm, but not when you're driving on a formerly sunny day and especially not in the beginnings of Spring. When I decided to visit Olympia recently, I got stuck in such a situation where all of a sudden, snow came down quite swiftly. The permeating chill and soft flakes of snow really made me thirst for a good cup of coffee. 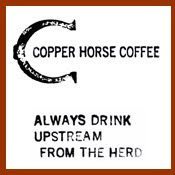 Fortunately, I had plans to stop at Olympia Coffee Roasting Co. and with little delay beside what the snow afforded me, I found the coffeehouse on what looked like a side street. The location sits in a large tan building, with a nice mural on the side and a very chic design to the storefront. The inside is broken into two sections; the large section in the back is the roasting facility and the front fifth is their cafe, with a handful of seats and a really boss front counter. Olympia has a nice variety of coffee and brews it on a Clover. I had a Mexican Chiapas on the Clover; the coffee produced a medium-bodied brew with flavors of hot chocolate and toasted nutmeg. The espresso, pulled short, tasted like a lemon drop followed with honey roasted peanuts. I did not note any tea. Walking back out into the storm, I slowly sipped my Mexican coffee as I walked to my car, savoring the gentle snow in its beauty before I got back on the road and dealt with it purely as a safety hazard. Needless to say, Olympia Coffee Roasting Co. took the edge off the drive and left my taste buds in serenity. If you're ever in Olympia, stop by the Olympia Coffee Roasting Co.